Commissioned in 1926, Route 66 stretched 2,448 miles from the shores of Lake Michigan in Illinois to California's Pacific coast. What better way to discover something of the diversity of America's natural landscape -- and the diversity of landscaping plants and decor exhibited by Americans across the fruited plain -- than to drive the "Main Street of America" from start to finish? That's just what we did in October 2009, even though it meant piecing historic Route 66 together across eight states (it was decommissioned in 1985) using special maps and Tom Snyder's Route 66 Traveler's Guide. As a landscaping enthusiast, I drove Route 66 with a camera at the ready, poised to record in pictures any scenes that I felt captured the essence of the states through which I passed. The result is the gallery of landscaping pictures that follows. Nor do I pass up the chance, here and there, to cite an example of the boldness, creativity or humor that homeowners sometimes put on display, for all to see, in their yards. Is not the personal touch, after all, the ultimate way to put one's stamp on the landscape? I'm talking about a landscaping component that says, "Here I am; I dare the neighbors to copy this!" We have an example of just such a personal touch in the picture above. 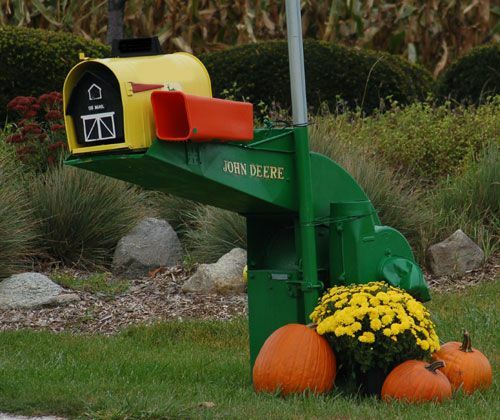 A mailbox post with a John Deere theme may be unusual in some parts of the nation, but Illinois is corn country! Continue to 2 of 33 below. We drove from the Northeast of the U.S. across the upper Midwest (to get to Route 66's beginning point in Illinois), and thence through the heart of the country to its southwestern corner. Rolling hills of fall foliage yield to Illinois cornfields. Missouri's Ozarks briefly interrupt those flat expanses, which, however, return with a vengeance in the form of the grasslands of the next three states through which Route 66 passes. As grass yields to cactus and the Rockies appear on the horizon, Easterners have every right to feel that they have entered into a strange new world. It is a world in which homeowners pay dearly for each and every thirsty plant they grow in their yards. The currency is water, which doesn't grow on trees. Which is neither here nor there, considering that there just aren't many trees around, anyway. But in Illinois, at the beginning of Route 66, we were still seeing plenty of fall foliage trees planted in people's yards. White ash trees are popular fall foliage trees in the nation's heartland, such as the one pictured above. Adding to the fall color are the burning bush shrubs. The landscaping in front of this Illinois home hides the fact that a cornfield out back stretches to the sky's end! Continue to 3 of 33 below. "In spring, when the dogwood is in flower, St. Peter is said to lock Heaven's gates so that Ozark souls do not return to a place of greater beauty." Continue to 4 of 33 below. Most people are content to affix a house number demurely to a mailbox. But in the Missouri "show me" spirit, this homeowner's house number is certain to be seen! With the influence of the cattle industry in this region, one would expect to see the occasional bull statue. But while we saw more cattle in Oklahoma and Texas (only 13 miles of Route 66 run through Kansas), it was Kansas landscaping that produced the best example of a bull statue for us. Continue to 6 of 33 below. But the fall decorating in this Oklahoma yard goes a step further with an imposing figure composed almost entirely of hay bales. As in the prior photo, it's an example of decor that seems to "fit" in a farming region. Continue to 7 of 33 below. Are you an aficionado of old gas pumps and other service station memorabilia...? Some people decorate their landscaping with old gas pumps and service station signs. I can think of no landscape better suited to such decor than a yard along historic Route 66 in Oklahoma (Tulsa having once been considered the oil capital of the world). Continue to 8 of 33 below. But this metal cactus mailbox post gave us a taste of what was to come further down the road on Route 66, as we continued to head west. But this Martian was kind enough to meet us halfway in his UFO, in Oklahoma. Continue to 10 of 33 below. When it comes to Texas landscaping (in the Panhandle, at least, through which Route 66 passes), toughness counts for a lot. In such a challenging environment, a path of stones contained by sturdy metal edging is eminently practical. Plants, of course, will also be under a lot of pressure from the environment in such a region, which is why xeriscaping is recommended. Continue to 11 of 33 below. Texas "horned toad" is a common nickname for this lizard, and you can see why. But whether you prefer horned "lizard" or "toad," this one looks awfully handsome basking amongst these drought-resistant plants. Continue to 12 of 33 below. This picture is of one of the ten Cadillacs lined up to form the famous display at the Cadillac Ranch in Amarillo. Each of the ten is partially buried in the ground, head-first. But the trees in the windbreak need to be tough in this harsh environment, plagued as it is by drought and strong winds. Enter the juniper tree. These evergreen trees were the closest thing to a constant, in terms of plant sightings, in our Route 66 travels. Continue to 14 of 33 below. How do you landscape a small urban front yard...? In a dry climate such as that in New Mexico, you could do worse than to plant yucca. Whether in people's landscaping or out in the desert, yucca plants are your constant companion as you drive Route 66 through New Mexico. Interestingly, though, yucca is not just a plant of the Western deserts. Yucca filamentosa, or "Adam's needle," is native to Southeastern America and does just fine as far north as the New England states. Continue to 15 of 33 below. Of course, pyracantha has wonderful aesthetic appeal, as well. Teamed here with wisteria, it helps set off a stylish Southwestern entryway. Continue to 16 of 33 below. With so few deciduous trees around, the aspen tree in this photo stands out like a sore thumb with its golden fall foliage. The related cottonwood trees inject a similar gold color into the autumn countryside in this part of the U.S. Such was my reaction when I spotted this Virginia creeper in Santa Fe, New Mexico. On the other hand, it will be easier to keep it under control. Regardless, Virginia creeper dresses up the Southwestern masonry wall in this picture nicely, displaying its red fall foliage and blue berries. Continue to 18 of 33 below. I adore the look of Boston ivy climbing the walls of a building. If you want to use Boston ivy in this manner, however, first make sure you're ready for a permanent commitment to it. For, once Boston ivy plants sink their "holdfasts" into a wall, that's just what they do: hold fast. And it will be difficult to pull the Boston ivy off without doing the wall considerable harm. The holdfasts at the ends of the tendrils of Boston ivy vines cling tightly to a wall. If you want the lovely look without risking damage to your wall, it's safer to train Boston ivy upon a trellis, pergola or arbor. Continue to 19 of 33 below. The kokopelli is a Native American symbol -- appropriate for New Mexico landscaping. New Mexico is famous for its Native American pueblos. Continue to 20 of 33 below. But it looks much more at home in Arizona. Prickly pear cactus grows to be about 6"-14" tall, and it bears showy yellow flowers, 2"-3" in diameter. The specimen shown in this picture is laden with the fruit that succeeds the flowers of prickly pear cactus. For landscaping purposes, note that a prickly pear cactus in bloom positioned next to a red hen and chicks plant makes for a striking rock garden tandem. In the picture above, some of those red rocks are put to good landscaping use in a stone wall. That wall, in turn, serves as the foundation for a rustic fence that would have made Zane Grey proud. Northern Arizona, where I snapped this photo, was Grey's old stomping grounds. Continue to 22 of 33 below. Another of the deciduous trees found in northern Arizona landscaping is the Lombardy poplar (pictured here), which belongs to that same poplar family. Lombardy poplar trees were another of those constants on the trip: plants we observed in neighborhoods in just about all areas along Route 66. We found Bradford pear trees, too, to be a popular choice in landscape plantings across the country. Evergreen trees in northern Arizona include ponderosa pines, Englemann spruce, blue spruce and juniper. Continue to 23 of 33 below. It's impressive the way the homeowner here has managed to carve out a space in which to grow the palm in such hilly country. The picture exhibits a nice example of terracing using small retaining walls. Continue to 24 of 33 below. All romance aside, tumbleweeds are really just a type of invasive plant from Eurasia, known as "Russian thistle." After flowering and setting seed, this rounded bush displays a fascinating adaptation as it enters the afterlife. Ditching its roots and becoming mobile (with the help of the wind), it rolls all over the place and plays Johnny Appleseed, dispersing its numerous seeds as it goes. Tumbleweeds easily become tangled up in fences and other obstacles, but a strong wind can shoot them along for miles. The best example of this we saw came while driving in northern New Mexico during a thunderstorm. High winds were whipping the rain in every direction -- but they were whipping more than just the rains. Tumbleweeds were crossing the highway with reckless abandon, bounding over every obstacle in their path like Olympic hurdlers. There's no way for me to estimate how great a distance those tumbleweeds traveled that night in just a matter of minutes! What appears to be the flower of bougainvillea is actually a foliar structure referred to as a "bract." The bougainvillea flower, technically, is much smaller and not nearly as eye-catching. Poinsettia is another well-known tropical plant that depends on bracts for its appeal. Endings ("ia" and "a," respectively) were appended to make the words sound more like plant names. And thus were born two of the most butchered words in the English language. For "poinsettia," it's the pronunciation that's the problem, mainly. People regularly insert a T after the N, so that the word most often ends up being mispronounced as point-SET-uh. But the correct pronunciations are poin-SET-ee-uh and poin-SET-uh. Although classified as a vine, bougainvillea often acts more like a shrub. As you can see from the picture, it can be used, e.g., in foundation plantings. Besides the red shown in the photo, bougainvillea flowers also come in pink, purple and yellow. To coax as many bougainvillea flowers out of your plant as possible, grow it in full sun and provide sufficient irrigation. If pruning is deemed necessary, do so just after the bougainvillea flowers have gone by. Continue to 26 of 33 below. In fact, at the hotel where I snapped this picture of ​a red bird of paradise, I remarked upon the plant to the owner, who called it "Mexican bird of paradise." But while we disagreed on the name, there's no disagreement about this shrub's beauty. After traveling west through rural desert areas on Route 66 for so long, one is struck, upon arriving in Needles, California, by the sudden reappearance of flowers. The town festoons itself with flowering shrubs, offering an oasis for the traveler who has had an eyeful of yucca and sagebrush. Red bird of paradise was just one of the dazzling shrubs to delight our eyes before leaving to cross the Mojave Desert. Continue to 27 of 33 below. If you're interested in xeriscaping in a warm climate but still wish to achieve superb color in the yard, the siren song of the oleander shrubs will probably eventually reach your ears. When it does, you'll have a decision to make, since these beauties are poisonous plants. If children or pets will be around, you may want to reconsider planting oleander shrubs. Continue to 28 of 33 below. That's a pretty good indication that lantana flowers are heat-tolerant plants. Although they come in other colors, lantanas with orange flowers are perhaps the most vibrant. If you're seeking a specimen that's columnar in form for your California landscaping but don't care much for Lombardy poplars (or want an evergreen tree), consider Italian cypress trees. Another possibility is Leyland cypress, although it does not grow with as severely columnar a form. Continue to 30 of 33 below. You usually hear of well-manicured front yard landscaping consisting of a lawn, right...? But I'll wager no lawn has ever passed the "manicured" test better than this planting of cactus surrounded by stone mulch in a California yard. In such dry climates, look for alternatives to lawns if you wish to achieve a low-maintenance front yard. Continue to 31 of 33 below. Whether you use the fruits or not, olive trees add value to a property with their attractive silver foliage. Continue to 32 of 33 below. One of the other common names for Joshua trees is "yucca trees," which -- considering that Joshua trees are really just a tall type of yucca -- seems a more apt name. Joshua trees are a symbol of the Mojave Desert and its environs. The one in the picture was growing in Barstow, California. In referring to bottle trees here, note that I am talking about a type of garden art, not about "bottlebrush" trees (Callistemon rigidus). Import a small dead tree to the site. If it has a nice branching pattern, you won't even have to worry about finding artificial branches and securing them. To stabilize the trunks of bottle trees, folks typically dig a hole, place the bottom of the trunk in, and pour concrete. Ready for Some DIY? Roll up Your Sleeves!